After a 2015 video of a sea turtle with a plastic straw lodged in its mouth sparked controversy about plastics, thousands of Americans took to social media, advocating for the ban of single-use plastic straws and promoting the popularity of the hashtag #StopSucking. Lately, the environmentalist uproar created change when the city of Seattle banned plastic straws altogether and Gov. Jerry Brown signed a bill Sept. 20 that implemented a California state-wide straw restriction. Legislation prohibiting dine-in restaurants from offering plastic straws to guests was signed recently by Gov. Jerry Brown, establishing California as the first state to ban straws and igniting a controversial debate about the harmful impact straws wreak on the environment. The straw debate began when a YouTube video of a sea turtle with a plastic straw embedded in its nose surfaced online, ultimately going viral and leading to the trending anti-plastic straw hashtag #stopsucking on Instagram and Twitter. 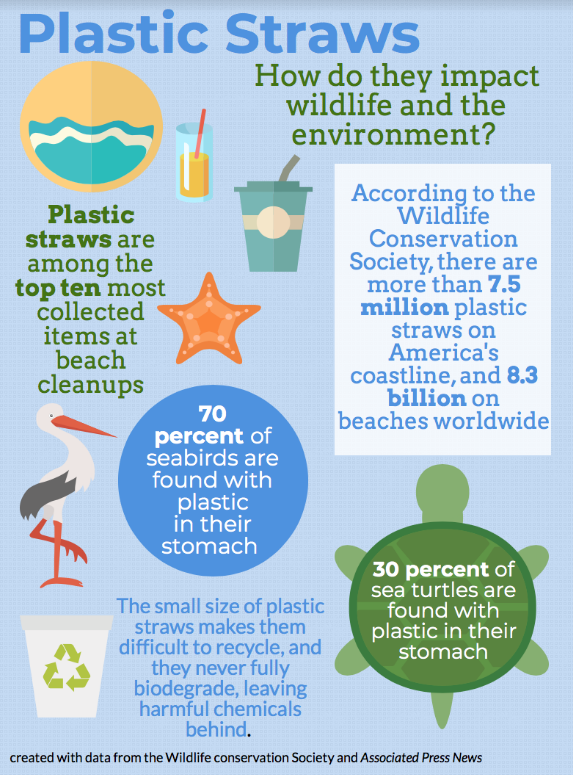 Despite increasing evidence illustrating the negative impacts plastic straws create for the ocean and its wildlife, many people continue to argue against a potential straw ban. However, plastic straws are a single-use product of convenience, and banning them is the first entry point in tackling plastic pollution, especially in the planet’s oceans. A ban will allow plastic straws to act as a gateway plastic, leading consumers to forgo additional single-use plastic items such as plastic bags and cups, subsequently increasing the quality of our environment by reducing the ocean’s pollution and toxins. “It’s such a small change people can make in their daily routines, but it heavily impacts the environment, and (it) will help us to decrease plastic pollution in the long-term,” Cathedral Catholic High School environmental club leader Helene Boggs ‘20 said. According to an estimate from the National Park Service, humans use more than 500 million straws daily, enough plastic to circle the earth twice. Due to their small size and polypropylene make, plastic straws often cannot be recycled, and they take more than 200 years to decompose. The 11th most commonly found ocean trash, plastic straws significantly contribute to the 1 million seabirds and 100,000 marine mammals that die each year from plastic consumption. “There is plenty of observational evidence of the mass of plastic in the oceans, and it’s negative impacts on wildlife and on marine ecology,” University of California, Berkeley professor of environmental science Mr. Ronald Amundson said. Plastic straws never fully degrade. Instead, they break down into smaller pieces, releasing chemicals harmful to marine wildlife and to humans. Because they cannot biodegrade through the work of microorganisms, plastic straws will never be fully off the earth, according to a recent National Geographic report. Motivating activists nationwide, emerging data highlighting environmentally damaging plastic straws has led many cities and companies to put in effect or to announce a straw ban. Starbucks, Disney, American Airlines, and SeaWorld recently announced they would be phasing straws out of their companies by 2020. Seattle, Washington was the first city to institute a straws-upon-request policy in July, 2018. Malibu, Oakland, and Berkeley are expected to follow. “It’s important for us to target the huge amount of plastic waste we generate,” Pennsylvania State University professor of environmental science Dr. Julian Avery said. “Ban straws, ban balloons, ban grocery bags, ban it all. Regardless of the environment, activists opposed to the plastic straw ban are raising concerns about people with disabilities, such as autism and multiple sclerosis, who depend on plastic straws to safely consume liquids. However, silicon straws are a viable alternative for the disabled because of their flexibility and durability. Reusable silicon straws received a five-star rating from Karin Willison, who suffers from cerebral palsy and works as a disability editor at digital health community The Mighty. Other reusable alternatives to plastic straws include bamboo straws, compostable straws, stainless steel straws, glass straws, and paper straws. The California straws-upon-request bill will be enacted in Jan. 2019. Under the state legislature, bill violations include a warning for first and second offenses, with subsequent infractions resulting in a $25 per day fine at a cap of $300, a small price to pay for vast environmental improvement. 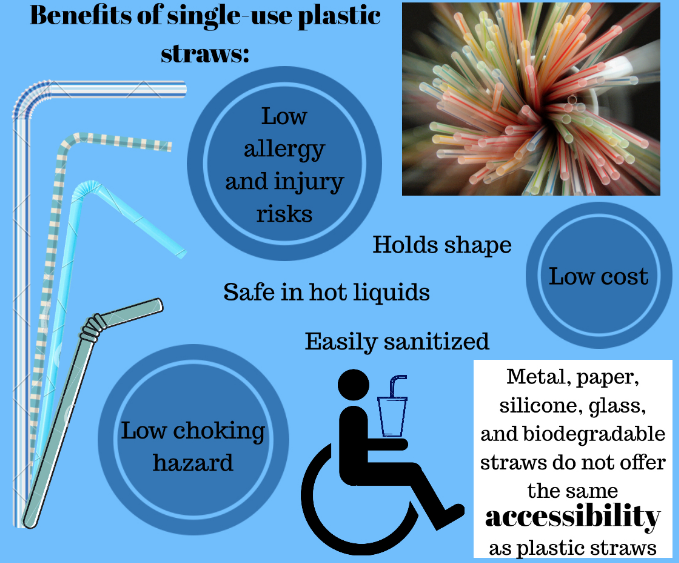 Although many other straw options besides plastic exist, single-use plastic straws prove as the safest, most accessible, and most cost-effective option currently available to disabled people. (Information according to Mrs. Jessica Kellgren-Fozard, a disabled advocate and YouTube personality). Imagine a Friday night out to dinner. Whether with a group of friends, on a first date, or spending quality time with your parents, the main goal of the experience is to have fun and to relax after a stressful week. Now, imagine the restaurant cannot provide for your needs, quickly turning the night into one of embarrassment and discrimination. This hypothetical is now a reality for the disabled population of the United States. The implementation of the California plastic straw restriction will cause two major problems: the loss of rightful accessibility to disabled people who depend on plastic straws to live and an ignorance of the more prominent cause of the world’s ocean pollution problem. First, nearly 20 percent of U.S. citizens reported having disabilities in 2010, according to the U.S. Census Bureau, and more than half of the respondents indicated living with disabilities they classified as severe. Many disabled people with limited hand or arm strength, missing limbs, seizures, or medical reasons that leave them bedridden depend on plastic straws to keep them healthy, hydrated, and safe. For those disabled people, straws are a necessity, not a luxury. Without the use of straws, disabled people risk aspiration of the liquid into their lungs, which could eventually lead to pneumonia and death. In fact, after the invention of the bendable plastic straw, advertisers first targeted sales to hospitals, as the easily sanitized plastic devices allowed patients to drink in bed. 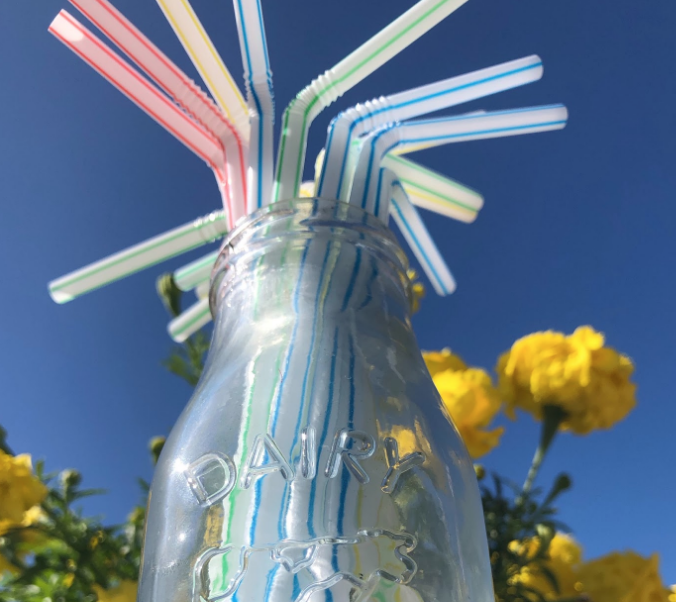 Although plenty of other straw options exist, none provide the same level of accessibility, reliability, and safety that single-use, bendable, plastic straws guarantee. Paper, metal, biodegradable, or silicone straw options may work for some disabled people, but they present choking hazards, allergy risks, disintegration after prolonged use, and difficulties regarding sterilization. Many disabled people have no choice other than using single-use straws on a daily basis for all their drinking needs. “People with a huge range of disabilities, such as people with cerebral palsy, muscular dystrophy, and multiple sclerosis, among many others, depend on plastic straws to access beverages and the very water they need to survive,” disabled woman and disability advocate Ms. Karin Hitselberger said in her article in The Washington Post. “For so many people with disabilities, something as mundane as a straw represents independence and freedom. The plastic straw restriction forces disabled people, who are already required to deal with the stress of their medical needs and daily stress, to add yet another action to make up for limited accessibility resources available in spaces created for able-bodied people. Fortunately, the restriction comes with an exception for those customers who specifically request for a plastic straw from the restaurant, which is required to provide one. However, this restriction can place unfair burdens and scrutiny on disabled people, who may experience trauma or difficulty requesting a straw, possibly forcing them to disclose unwillingly their disability to guarantee their medical need is met. “It’s already not easy or pleasant asking for help in public spaces like restaurants,” disabled woman and founder of Disability Visibility project Ms. Alice Wong said in her Eater article. “This is the experience of living in a world that was never built for you, having to explain and defend yourself while providing infinite amounts of labor at the demand of people who do not recognize their nondisabled privilege. The restriction strips establishments of hospitality and accessibility, problems already dealt with by disabled people in dozens of social and legal circumstances. From the environmental aspect, many advocates single out plastic straws as a gateway plastic to a larger plastic pollution conversation. Plastic pollution in oceans, undoubtedly a major problem, requires activism and campaigners fighting for solutions, but plastic straws are not the most effective problem to advocate against. According to U.S. News & World Report, straws make up a mere four percent of plastic trash by piece and far less by weight. Banning straws barely would make a dent in the ocean pollution problem. To better solve the issue, environmentalists must look at the facts. Floating in the Pacific Ocean in between Hawaii and California lies the Great Pacific Garbage Patch, the world’s largest and most famous collection of floating trash, double the size of Texas or France. Microplastics, extremely small pieces of plastic debris formed from the breakdown of consumer products, measure to only eight percent of the 88,000 tons of plastic in the patch, 16 times more plastic than originally thought, according to a study by Mr. Boyan Slat and his team of scientists at The Ocean Cleanup, an organization Mr. Slat founded to attempt a cleanup campaign of the patch. Surprisingly, Mr. Slat’s study resulted in another alarming statistic. Of the 1.8 trillion plastic pieces, 46 percent of the trash in the patch consists of fishing nets, and a majority of the rest consists of other fishing industry gear. “[Mr. Slat’s] study is confirmation that we know abandoned and lost gear is an important source of mortality for a whole host of animals, and we need to broaden the plastic conversation to make sure we solve this wedge of the problem,” chief scientist at the Ocean Conservancy Mr. George Leonard said in response to Mr. Slat’s findings. According to the information provided by The Ocean Cleanup, 40,480 tons and 828 billion of the plastic pieces compiled in the patch result from ghostnets. Ghostnets, fishing nets purposely or accidentally discarded into the ocean, drift through the waters, and often entangle and injure whales, seals, and turtles. The incredibly severe effects of ghostnets recently caused travesty in Mexico when approximately 400 olive ridley sea turtles, listed under the endangered category in Mexico, died from apparent entanglement in ghostnets. But how do these facts relate to plastic straws? The amount of ghostnets found in ocean pollution makes the straw ban controversy almost laughable. If environmentalists and Americans focused less energy on banning plastic straws, an action with the power to harm millions of people, and instead focused on cleaning up ocean pollution and lowering the amount of ghostnets and abandoned fishing gear left in the ocean, then potentially they could create change worthwhile. Fortunately, The Ocean Cleanup recently set sail from San Francisco to begin its attempted garbage patch plastic cleaning, using a 2,000 foot long floating barrier with a 10 foot skirt that hangs below the water to collect plastic. The ocean needs saving. The amount of floating plastic in the sea has reached ridiculous proportions, but restricting plastic straws, an action guaranteed to hurt thousands of individuals, should not be the way to tackle the issue. A nation’s greatness is often referred to how it treats its weakest members. Imagine once again that person unable to get a drink at a restaurant, and answer if that treatment seems right or equitable.